If you want a 800x600 theme which use the 24-pixel high large fonts in E2B and increases the spacing between lines, you can try the GreatLakes_DNA.zip download in the Alternate Download Area - Themes folder. 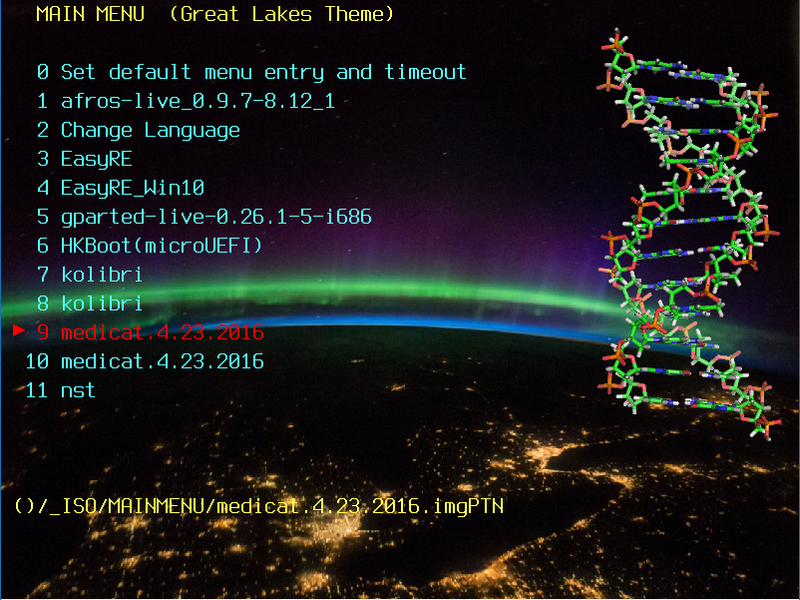 It includes the rotating DNA animation and the background is a shot of the Great Lakes taken from space. As with all animations, you can use the F2 key to make it disappear and then press F2 again to make it reappear. The space between menu lines has also been increased. The F1 Help menu is suppressed because the help text does not fit on the screen when using large fonts. The .bmp file is actually compressed using LZMA.exe. There are several different 24-pixel high large fonts to choose from - try using a different one by changing the MyE2B.cfg file. When using Windows ISOs, etc., you may need to reduce the number of XML files, so that they will fit on the screen nicely. Get Windows 10 Professional for £4 (legally)? Windows 10 bug found in Calc App! Beware of this 'fast' USB 3.0 Flash drive!